Since 2003, I’ve been receiving, along with many other Canadian authors, an annual payment from Access Copyright Canada. This organization is a nonprofit, national organization who licenses the copying of the work of Canadian creators (including visual artists, publishers, and others) to educational institutions, businesses, governments and so forth. They then pass the monies collected onto the copyright holders. (You can read more about this on their website). My highest income came in 2012 (over $870, however, after that time, the Supreme Court of Canada added a “fair-dealing” provision to the copyright law and, let’s just say, it’s been a game changer. Over recent years, educational institutions and others have since challenged how much they should pay to share, remix, or copy someone’s work. Access Copyright has since been forced to significantly reduce payments to copyright holders. Despite adding a new book to the roster nearly every year, the cheque I received this year was just over $200.00. A recent article in Quill and Quire reports that the organization might have to reduce payments by as much as 55% in 2017. You can read the reasons HERE. In a world where writers earn well below the poverty line as it is, and people (I’ve seen them) think it’s quite okay to photocopy an entire book, it’s just another unneeded obstacle in the quest to be paid for our hard work. Ironically, I’ve been selling my mystery novels at Christmas craft fairs this month, and have found that customers are happy to pay full value for books primarily because they love mysteries and believe in supporting local authors. These people aren’t loaded with money. But they are loaded with goodwill, a love of reading, and respect for artists. You could well argue that this is an apple and oranges issue; that buying an author’s book at a fair is hardly the same as paying a pittance, if anything, to photocopy copyrighted work for teaching and research purposes. But for me, it all boils down to the same issue: what value do people place on a book? Does it have any value at all? Or only as long as it doesn’t interfere with their own agendas and priorities? Maybe everyone, including, businesses, governments, educational organizations, and even the Supreme Court of Canada, should be giving this further serious thought. I'm very pleased and proud to announce that I have a short story in this year's annual Marion Zimmer Bradley Sword & Sorceress anthology, this one being 31. 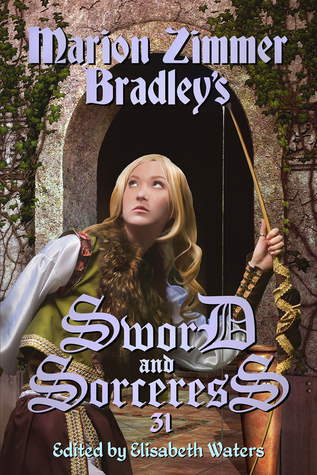 Sword & Sorceress 31, edited by Elisabeth Waters, was published November 2, 2016 and is entirely suitable as as gift for Christmas, Hanukkah, Kwanzaa, Twelfth Night, Winter Solstice, Yule, etc. It is available in trade paperback, Kindle, Kobo, and Nook formats. Ever tried to get over your fears? It’s pretty daunting, isn’t it? For writers, I think there’s plenty of things to worry about, and possibly fear, but I sometimes wonder if we project too much fear into our careers. Although we do invest a lot of time, money, and hopes into becoming published and/or making a bestsellers list, the fact is we’re not surgeons or cops or firefighters dealing with life or death situations. Sure, penning ideas to paper can have high stakes, but not on a daily basis. Yet, many of us so passionately care about writing, being read, and earning money from our words, that the deep caring can be crippling. For me, I experience both fear of failure and fear of success to varying degrees. Most of the time, they’re well under control, but occasionally the feeling threatens to send me running. I start thinking about packing it in. But I then I remember why I’m really doing this—the love of writing—and then the boiling point relaxes to a simmer. Doing a little bit of editing and/or writing each day works for me. Stamina and discipline are two things I have going for me. But a blog from John Athanasiou (HarperCollins UK), in which he lists the things that everyone in publishing needs to succeed, gave me pause to think. Although the article might be directed at employees of the publishing biz, I think a great deal of it applies to indie writers. Some of the things on his list I’m already doing, such as creative problem-solving. Another great tip is called learning with agility. What he means by this is to not be afraid to fail frequently and fast, provided that you learn from your mistakes and move on. Moving on quickly has been problematic for me. I stuck with the wrong agents for far too long, sought the wrong types of publishers, and attended the wrong types of conferences. I’m still learning to figure out how much time and energy to spend on social media, and to drop strategies that don’t work for me.